As discussed, this month I am going to do the 28 Days Later Drawing Challenge. I am posting the pictures here too because there is a literary theme – I am doing a series of images as research for a new theatre company called Inglenook, who are debuting a kids show called East of the Sun and West of the Moon at this year’s Edinburgh Fringe Festival. 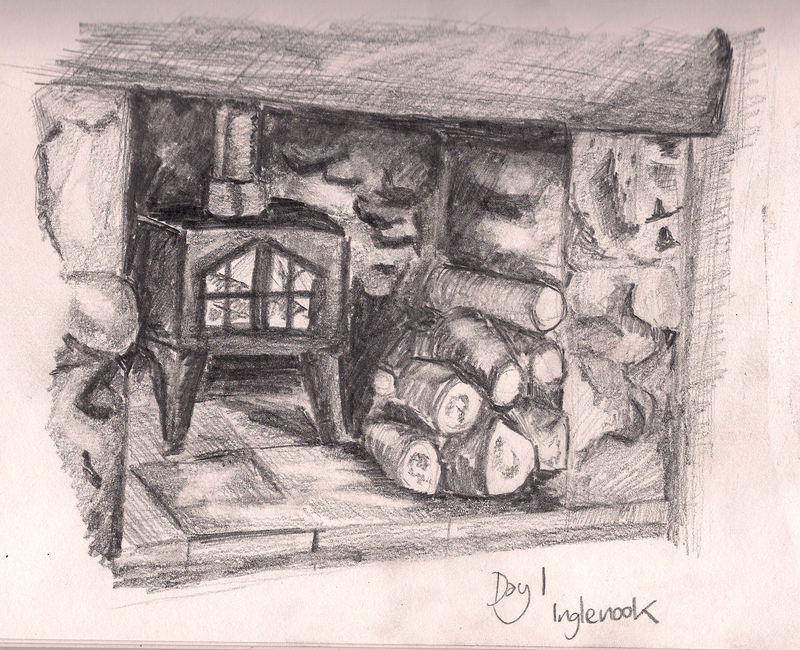 Image the first is an inglenook, or old fashioned fireplace – because they’re going to need a logo at some point. I thought drawing this might help me think of an idea for one, but no joy so far. I mainly just feel the need for some better pencils. And shame that I haven’t drawn without the aid of a graphic tablet in months. Anyway, if you want to see what other people are doing this month, or even join in, you should ‘like’ the Facebook page. I would highly recommend you do as well, there are already loads of brilliant pictures on there.